Shadowlight Artists have 8 films being screened at the seventh annual Together! 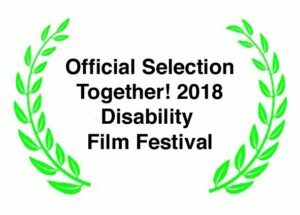 2018 Disability Film Festival, which takes place from 7-9 December 2018 at the Old Town Hall Stratford, London, screening films by Deaf/Disabled filmmakers and films with a strong central Deaf/Disabled character. The Festival is free, fully accessible and welcomes everyone. All screenings are ‘relaxed’, a variety of seating is available, and light refreshments are served. All the Shadowlight Artists films will be screened on Saturday 8th December in categories Artists Films & Videos (1.45pm), Animate! (3.15pm) and Dance (4.15pm). The group will be attending the festival that day. A new ratings system, the D system, has been introduced by the Together! Disability Film Festival to highlight the contribution that Disabled people make in front of and behind the camera, and their widespread absence from the film world. The D-system is based on the F-system developed by Bath Film Festival to highlight the contribution/absence of women, which has now been adopted by more than 40 film festivals internationally. All the Shadowlight Artists films will be rated D (for disability) under new rating system introduced by Together!.